In a gruesome incident, a 64-year-old retired Food Corporation of India (FCI) official and his eight-year-old granddaughter were bludgeoned to death by unidentified assailants at their residence in Punjab Mata Nagar near Pakhowal Road today. City residents are in for a tough time with the Ludhiana Municipal Corporation officials proceeding on an indefinite strike following suspension of MC Commissioner Malwinder Singh Jaggi. 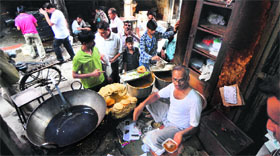 Frequent change of statements by the vegetable vendor whose makeshift shop at Dandi Swami Chowk was razed by the MC tehbazaari wing officials twice, has raised questions on the genuineness of his allegations. The wife of a dera chief succumbed to burn injures at a local hospital in the city today, five days after she was set on afire. The city police today arrest a person who had allegedly snatched gold earrings of a woman in Haibowal a few days ago. Although malls have started cropping up in the city, traditional markets continue to maintain their charm for residents of the city, as they say malls can only be an addition but they cannot replace traditional markets. It seems that the operators and owners of various public places such as marriage palaces, cinemas, shopping malls, factories, hospitals and other commercial buildings have learnt no lesson from the tragic fire incidents taking place across the state in the past. 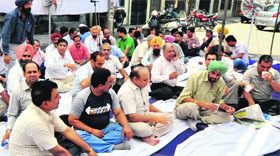 On a call given by the United Forum of Bank Union (UFBU), officials and workmen of the Punjab Bank Employees’ Federation (PBEF) staged a dharna in front of Canara Bank today. Irate residents blocked traffic on the Tibba road, following death of a man. 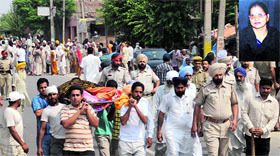 Nirmala, wife of the deceased, identified as Ram Sukh (60), alleged that her husband died due to the police pressure. Increase in the power tariff of 12.08 per cent for the financial year 2012-13 announced by the Punjab State Electricity Regulatory Commission on Monday has came in for sharp criticism at the hands of the people from all walks of life who have termed it as a rude shock. The latest decision of the Punjab State Electricity Regulatory Commission and Punjab State Power Corporation to hike power tariff from 55 to 58 paisa per unit for industrial consumers and 53 to 58 paisa per unit for domestic consumers with effect from April 1, but announced on July 16, is vehemently been opposed by president Gurmeet Singh Kular and chairman Manjit Singh Khalsa, United Cycle Parts and Manufacturers’ Association. The financial market management department of BCM Arya Model School organised a guest lecture on trading of capital market for Class XII students on Tuesday. Sandeep, area manager (Punjab & J&K), the SBI CAP Securities, delivered a lecture on trading techniques and Demat functionalities and market outcomes. The district dental health department, which is celebrating the dental fortnight in the district reveals that despite making students of government schools aware about dental hygiene, problems and its solutions, these students fail to turn up for free dental treatment at the Civil Hospital. A training course on dairy farming titled “Adopt dairy farming for the progress of Punjab” was inaugurated at GADVASU today. Computer training on dysfunctional computers! It may sound strange that the education department is providing computer training to government teachers on dysfunctional computers. 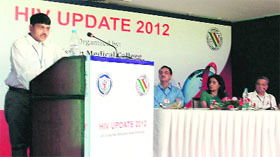 The conference on HIV/AIDS was organised in collaboration with DMCH and CMCH. About 350 doctors from the region participated in the conference. Two farmer members of the Punjab Agricultural University (PAU) Kisan Club bagged prestigious awards during the 84th Indian Council of Agricultural Research (ICAR) foundation day celebrations held yesterday at the National Academy of Agricultural Sciences (NASC) symposium hall, New Delhi. Unscheduled power cuts and frequent load shedding by the Punjab State Power Corporation Limited (PSPCL) for last of couple of days in the mega city have made life tough for residents. A cyclist reportedly fled with the gold earrings of a woman at Ghumar Mandi today. It is learnt that the cyclist grabbed the throat of the woman seated in a parked car. A resident of Sangrur, identified as Ramesh Kumar, was killed when his car (PB-08B-1439) overturned and fell down from a bridge of a canal between Goraya and Phillaur near Bhattian village late last night. One person was killed and three injured in two different accidents near Dehlon on the Ludhiana-Malerkotla road this afternoon.